In this pest treatment guide, you will learn about silverfish, a type of wingless insect that has the potential to completely destroy a wide assortment of items in and around the home. If you are searching for effective pest control silverfish techniques, you will find them here. The silverfish is an insect that varies in color – from white, brownish-grey to bluish-silver. The shape of the insects resembles teardrops. The insects measure anywhere from 12mm to 19mm in length. The rear of the creature contains three, exceptionally long bristles. These insects have the ability to grow from the egg stage of their lives to the adult stage of their lives without any changes in their overall appearance, apart from length size. The more you know about silverfish, the better you will be able to administer a pest treatment that will be effective in preventing and combatting these insects. Continue reading to enhance your knowledge and help you success in administering pest control silverfish techniques. When it comes to pest treatment techniques for silverfish, it is imperative that you know a bit about their behavior and the basic habits that the pests have. First, these creatures have the unique capability of thriving in nearly all climates; however, their dwellings are general in areas that are both dark and a bit on the damp side. Examples of these areas include the basement region of a home, the attic, the bathroom, and even the kitchen. Paper products and clothing that contains some degree of moisture actually attracts silverfish. Many of the items that silverfish are attracted to may be found within storage boxes, which are typically kept in shed units, storage rooms, and garages. Silverfish are highly attracted to items that contain a high level of carbohydrates. The main carbohydrate products include those that contain a high level of starches and sugars. This opens up many objects in and around your home as food sources for silverfish. Examples include the glue contained within books, various types of shampoos, cellulose in clothing, bed linens, and deceased insects. When administering pest control silverfish tactics, it is imperative to consider the types of materials that the insects are attracted to and take steps to deter them from those products. Humidity and general moisture are highly attractive to silverfish. You should eliminate sources that create a large amount of moisture and/or humidity, such as faulty plumbing or excessive condensation on appliances or your air conditioning unit. Use a dehumidifier in and around the home and take dehumidifying steps, such as ventilating your attic and rooms that are typically closed, eliminating any type of standing water, and running an air conditioning unit to reduce heat within the home. When storing food in the pantry and/or cabinet spaces, be certain to place it in containers with tight-fitting lids. You should ensure that you vacuum out small locations – such as cracks and crevices – in and around your home with a tip attachment that is very narrow. Spray the entire perimeter of your home with a residual-based insecticide. The inside area should be sprayed with a narrow band of the insecticide and the outside area should be sprayed on the foundation so that silverfish do not move inside of the structure. Cinnamon may be used where an infestation is present or suspected; however, it is important to understand that cinnamon will not kill the insects, it will only repel them. Additionally, this is not an effective measure against silverfish eggs. Citrus sprays may be used to repel silverfish. Diatomaceour earth, or “food grade”, is a specially-designed powder, white in color, that actually dehydrates silverfish. This is not toxic to people, children, or pets; however, it is so toxic to silverfish that, just by walking over it, they will die. Mothbags are an effective pest treatment for silverfish. Silverfish do not like the smell or texture of cedar shavings. Silverfish have the ability to destroy books, clothing, important documents, and a wide range of other items in and around the home. You should always take the steps necessary to prevent an infestation. If you find that your home has been invaded by silverfish, you may take the steps outlined in this guide to address the complication. However, these steps may not always work. If you find that you are perplexed by a silverfish infestation, you should seek the assistance of a professional pest control company. Not only do they have the ability to eliminate the pests quickly and easily, the treatment is rather inexpensive. 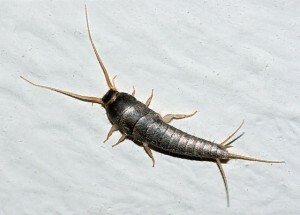 For more information, contact All Pest Exterminating Inc today at 765-965-2171 for pest treatment techniques for silverfish.